John Oliver talks Scott Wagner's "golf spikes" midterm election ad. 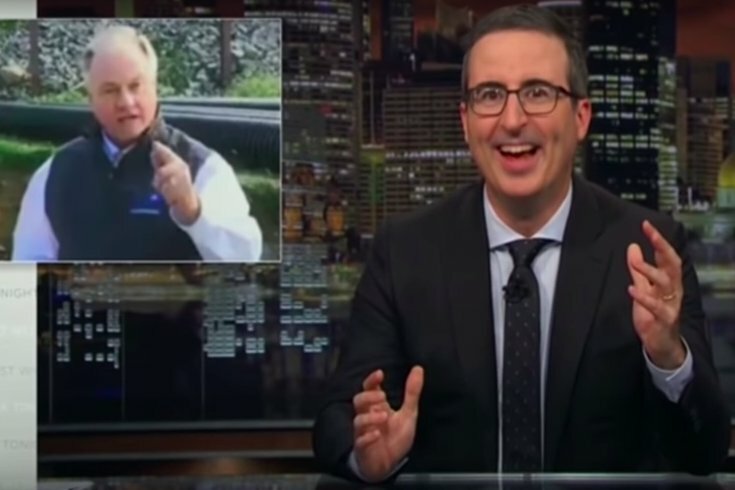 John Oliver, who hasn't been shy about highlighting Scott Wagner's understanding of the environment, took fresh aim at the Republican gubernatorial candidate from Pennsylvania on Sunday's episode of "Last Week Tonight." RELATED: Scott Wagner, GOP candidate for governor, says he’ll stomp on opponent Tom Wolf’s face 'with golf spikes"
Oliver opened Sunday's show talking about midterm election ads, paying special attention to Wagner's viral, low production "golf spikes" video that originally had appeared on his campaign's Facebook page. Unfamiliar with the bizarre display? Let us catch you up here. The gist: Wagner's latest election platform includes a promise to "stomp all over (Gov. Tom Wolf's face) with golf spikes" because Wagner is "sick and tired of (Wolf's) negative ads." "How can you be anti-negative ads when your entire ad feels like a man getting into a fight in the garage?" Oliver asked of Wagner. He noted some other particularly memorable attack ads from this midterm election season before delving into the episode's main story: the alleged murder of Washington Post journalist Jamal Khashoggi by Saudi agents in Istanbul, Turkey, and President Donald Trump's close relationship to Saudi royals. This is not the first time Oliver has poked fun at Wagner. Last year, after Trump pulled out of the Paris agreement on climate change, Wagner was at an event where he described his theory about what is causing climate climate change. "The earth moves closer to the sun every year. We have more people. You know, humans have warm bodies, so is heat coming off? We're just going through a lot of change, but I think we are, as a society, doing the best we can," Wagner said at the time. Oliver was taken aback by the Republican's understand of the environment. "I don't even know where to begin there," the "Last Week Tonight" host said during the June 2017 episode. "I mean, yes, the Earth does move closer to the sun every year, but then it moves further away from the sun because that is what a f***king year is." Our body heat is not warming the planet, and we are clearly not doing the best we can because we keep putting idiots like Scott Wagner in positions of power." Wagner publicly reacted to that Oliver shout-out, sarcastically thanking him and inviting himself on the show. Time will tell if Wagner attempts to fire back again. Below is video of "Last Week Tonight's" segment about the complicated relationship between the United States and the Saudi Arabia government.